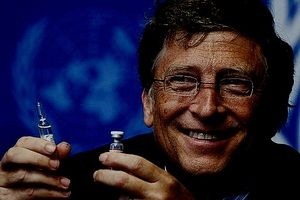 Bill Gates Says Global Vaccination Program is "God's Work"
Indeed, the religious tone of Gates during the course of the interview may seem confusing to Tweedie, but the nature of Gates’ work could very well be described as a religion. Thus, the fact that it finds itself in direct confrontation with another religion – the Islamist groups that Tweedie speaks of – is of no real consequence to Gates as his solution is to dutifully press forward. Yet, before readers write off the vaccine resisters solely as Muslim fundamentalists, many of the individuals opposing vaccination have a very good reason to be skeptical. Especially those that believe Gates’ vaccine push is geared more toward sterilization and population reduction than about life extension and better health conditions. Add this to Gates’ statement is the fact that, time and again, international vaccination programs have ended disastrously for third world nations. Case in point: the recent Meningitis vaccine program that resulted in the paralysis of at least 50 African children and a subsequent cover-up operation by the government of Chad. This large number of adverse events occurred in one small village alone, leaving many to wonder what the rates of side effects might be on an international scale. Indeed, as the doctors assert, one cannot vaccinate away disease like polio. Apart from the fact that there has never been a study conducted which proves a vaccine either safe or effective that was not connected to a drug company or a vaccine maker, the so-called cure, if it comes under the guise of a vaccine, may well be as bad if not worse than the disease itself. In the end, the answer is about raising living standards, reducing pollution, increasing knowledge and access to proper nutrition and clean drinking water – not chemical and virus-laden needles. Perhaps this method could be more accurately described as "God's work." This page contains a single entry by sal published on January 28, 2013 12:24 PM. Grape Seed Extract May Beat Chemo in Late-Stage Cancer was the previous entry in this blog. Oncologists Conceal Toxicity Issues and Bias is the next entry in this blog.